The majority of the flower beds and gardens have been entrusted by Basildon Borough Council to Friends of Lake Meadows to manage and improve. These include the herbaceous borders by the tennis courts, the nearby rose beds and since its refurbishment the garden around the Child in the Park statue. In addition we look after the rhododendron bed and the new rockery and grasses area by the lake. 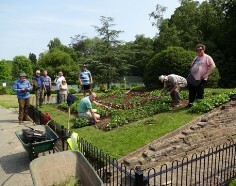 FoLM has formed an informal gardening group that within a limited budget, plans and maintains the beds. The group meets every Tuesday between 9:30am and 11:30am by the tennis courts. We plan to start our 2019 campaign on February 5th. We would love to increase the number of volunteers willing to join us on Tuesday mornings. With more people involved we will be able to raise the standards we achieve. If anyone wishes to be involved please email by clicking here.